Subaru has announced pricing on two limited run exclusive 2013 Special Edition WRX and WRX STI sedan models that will be coming to the U.S. this spring. Back in October, Subaru unveiled two new 2013 WRX and WRX STI Special Edition four-door models at the SEMA Show in Las Vegas. The cars arrived just in time for Halloween and SEMA Show attendees were greeted with a very different paint scheme. 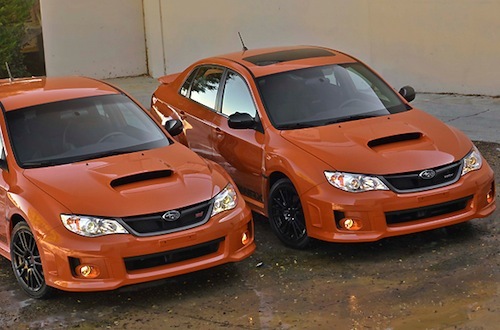 Today, Subaru announced pricing on the special “Orange and Black” Special Editions that will be offered for U.S. buyers. Interested buyers will need to act quickly because the Special Edition line-up is limited to 300 examples with just 200 WRX sedans and 100 WRX STI sedans. The 300 examples that will be produced in Japan, will come with Tangerine Orange Pearl paint off-set with jet black custom wheels, black front fender badging and exterior mirrors. The Special Editions cars also receive black exterior graphics to set them apart. The sporty WRX and WRX STI already attract the attention of the local law enforcement, but the new orange exterior color is sure to attract even more attention now. Anyone who has driven the WRX STI knows it’s made for performance and can’t be driven slow. Inside, the WRX Special Edition features the dark interior trim from the WRX STI, including a black headliner. The Special Edition orange interior is also applied to the stitching on the seats, doors and shift boot, and custom orange trimmed floor mats. Both vehicles also feature front fog lamps for better vision taking on the curves at night. Under the hood, the two special edition models will feature the Subaru boxer engine that keeps the center of gravity low on the high-performance sedans. They will also come with Subaru’s very effective Symmetrical all-wheel-drive system to keep all that power and four wheels firmly planted on the ground. The 2013 WRX Special Edition will pump out 265 horsepower with 244 lb.-ft. of peak torque at 4,000 rpm. The 2013 WRX STI Special Edition model is track-inspired and delivers more horsepower than any other production Subaru with 305-horsepower and features a turbocharged Boxer engine. It comes mated to a six-speed manual transmission and exclusive Multi-Mode Driver Controlled Center Differential (DCCD) version of Subaru Symmetrical All-Wheel Drive. The WRX STI is also equipped with Subaru Intelligent Drive (SI-DRIVE) and a Multi-Mode Vehicle Dynamics Control (VDC) system, the latter featuring a track performance-optimized mode. It will also come with Brembo performance brakes to stop the performance STI model quickly. Subaru WRX / WRX STI fans who aren’t too crazy about orange can check out the new interactive brochure and order a different color. The newly released dynamic online brochure offers 23 pages of interactive tools where fans can zoom in, bookmark pages or print all or select pages. Fans can check out the new online brochure and design their own car. Both sedans will officially go on sale in spring of 2013, but if you are interested in one of these limited run sedans, you need to act quickly. Interested buyers can contact their local Subaru dealer to get on the exclusive and short list for the 2013 Subaru WRX and WRX STI “Orange and Black” Special Edition models. I believe 305HP is the standard HP rating for all Subaru STIs of the latest generation.